You may wish to read page one first. Many other cardinals followed the example set by Cardinal d'Estouteville in S. Agostino, so appropriate inscriptions in Chiesa del Gesù celebrate Cardinal Farnese, in S. Carlo ai Catinari Cardinal Leni, in S. Ignazio Cardinal Ludovisi. 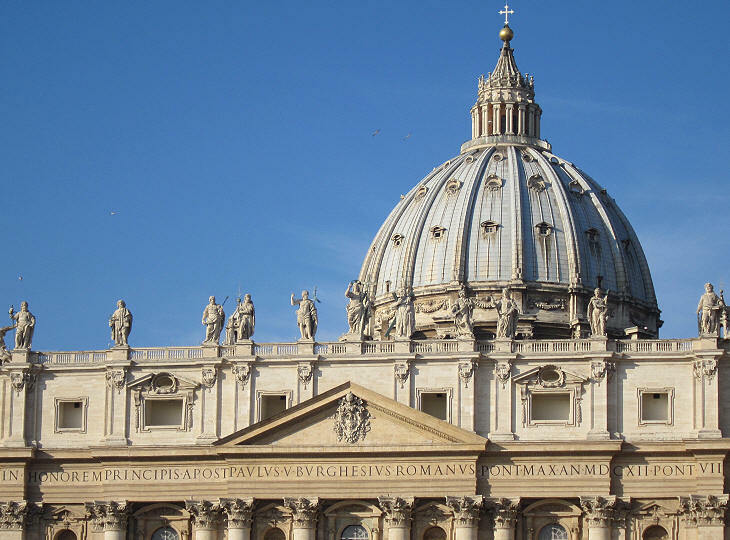 The popes too wanted their names to be strictly associated with the monuments they built. Pope Sixtus V (1585-90) in particular promoted a major redesign of Rome: among other initiatives he restored several ancient obelisks and the two "cochleal" (reminding the viewer of the spirals of a snail-shell) columns of Marcus Aurelius and Trajan. He added inscriptions celebrating the restoration to the original ones which made reference to the emperors. His preferred architect, Domenico Fontana, arranged for the inscriptions to appear consistent with the old ones as if they had been engraved 1,500 years before (see the small icon at the top of the page showing a detail of the inscription on the base of Marcus Aurelius' column). One of the new roads drawn by Sixtus V linked S. Maria Maggiore with S. Giovanni in Laterano, but not with the main entrance of the basilica (facing the countryside), rather with its right transept (which faced the city). He therefore built a large loggia and a grand entrance on the external wall of the transept giving it the pomp of a façade: in a way the transept of the basilica became a church of its own inside the basilica and Pope Clement VIII (1592-1605) completed the work of his predecessor by placing an organ on the inner wall of the right transept and by erecting for the 1600 jubilee a gigantic altar on the opposite side. The small sacred image painted in the tympanum is overwhelmed by the overall pagan appearance of the altar. The four bronze columns supporting it are ancient, although their exact origin is uncertain and some traditional accounts are rather fabulous (cast by Augustus with the bronze taken from Cleopatra's ships, brought to Rome from Jerusalem by Titus, filled by Constantine with earth of the Holy Land sent by his mother Helena). They were carefully restored and the star shining on their capitals was added to make reference to one of the heraldic symbols of the pope. The inscription adds to the pagan appearance of the altar: only the name of the pope and the date expressed only with reference to his tenure in office: his title, P.(ontifex) M.(aximus) is the same used by the Roman emperors. A few years later Pope Paul V (1605-21) had the opportunity to celebrate himself on the basilica which symbolizes the Roman Catholic Church: S. Pietro. Again the religious aspect got less relevance than the mundane one: the reference to St. Peter - IN HONOREM PRINCIPIS APOST(olorum) - is dealt with in the left side of the inscription, while the name of the pope and his family name occupy the central space. 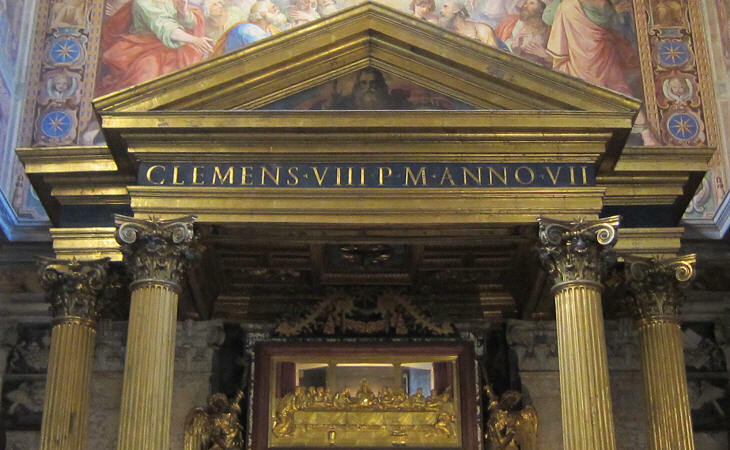 They are emphasized by the tympanum (above) with the papal coat of arms and by the balcony (below) where the pope appears on the greatest occasions (including his first appearance immediately after the election). 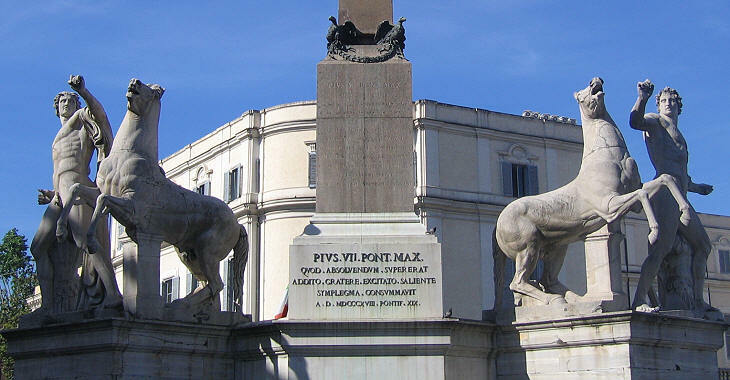 Also Piazza S. Pietro is dominated by two gigantic inscriptions celebrating Pope Alexander VII (1655-67). Eventually the exposure given to the names of the popes came under criticism and the texts of the inscriptions of the new façades of S. Giovanni in Laterano and S. Croce in Gerusalemme, while retaining a reference to the pope who built them, gave more space to the religious aim of the basilicas. The inscription in S. Giovanni clarifies that the basilica is dedicated to both the Baptist and the Evangelist. The construction of new aqueducts and the restoration of old ones provided the popes with another opportunity to celebrate their accomplishments through inscriptions following Ancient Roman patterns. Emperor Claudius gave his name to an aqueduct (Aqua Claudia): the same did Sixtus V, but he was clever enough not to call it Acqua Sista, but to use his original name Felice, so that Acqua Felice suggested that the water was happy to be quenching the thirst of the Romans. The last part of the inscription (FELICEMQ.ue DE NOMINE ANTE PONT.ificatus DIXIT) explains the process followed in naming the aqueduct. The inscription details the origin of the water and the length of the aqueduct, very closely following the sentences engraved in Porta Maggiore. A few years later Paul V commissioned a very similar inscription for his Acqua Paola. The inscriptions following the pattern of those of Ancient Rome did not fit in with the design of Baroque monuments: their straight lines were in sharp contrast with the prevailing curved lines designed by Bernini and Borromini. Other more suitable scripts could have been chosen, some of which had been developed in Italy (e.g. scrittura corsiva which for this reason is called italics). The weight of tradition, however, was such that Capital Roman letters were regarded by those who commissioned a monument as the only ones appropriate to remind the viewer of the virtues of the deceased. Bernini, acknowledging that he had to meet the wishes of his customers, found a way to continue using Capital Roman scripts, while at the same time getting rid of their rigidity: he just wrote them on a piece of cloth, which obviously was shaken by that same wind we see in all his sculptures. For more than a century Roman sculptors proved their skills engraving inscriptions on a curved surface: the image used as a background for this page shows an inscription in S. Andrea al Quirinale. You can see another example in the Monument to Elisabetta Chigi Odescalchi in S. Maria del Popolo. In the second half of the XVIIIth century Neo-classicism brought about a return to tradition. In addition the inscriptions of this period made use of bronze letters, in line with the Ancient Roman practice as shown in the examples above and below. For a very different kind of inscriptions have a look at Palazzo della Civiltà del Lavoro.